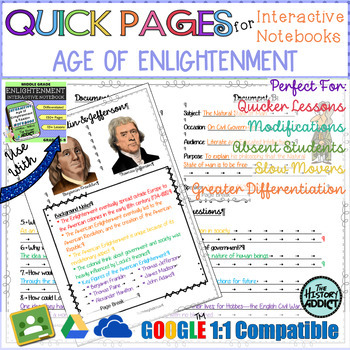 Quick Pages for Interactive Notebooks are simply 2D pages that match the information from each lesson in the Interactive Notebook for the Enlightenment Era. They come in 2 versions: 2D student-filled templates and 2D pre-filled templates. If you need a digital interactive notebook template, they are on the way. I created this resource after experiencing a particularly difficult year with using interactive notebooks in the classroom. Absent students are still one of my biggest pet peeves. I also notice that many students require stronger accommodations than the notebooks themselves provide. And at times, I just need to move faster than interactive notebooks allow. If this sounds like you, worry no more. Here is the solution! Sometimes, you might find it necessary to get information into the interactive notebook without a full-blown interactive notebook lesson. These Quick Notes offer the perfect solution for an interactive notebook lesson that won’t break the clock. Since the templates are all 2D, the student has only to simply fill in the missing information for each page. You can have them copy the information right off of the pre-filled template, provide the information yourself, or use my interactive notebook instructional companion PowerPoints. 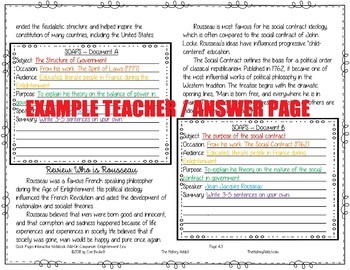 And for the ultimate quick lesson, simply provide students with copies of the pre-filled templates. Accommodating for absent students can be one of the biggest pains with interactive notebooks. Well, no more! 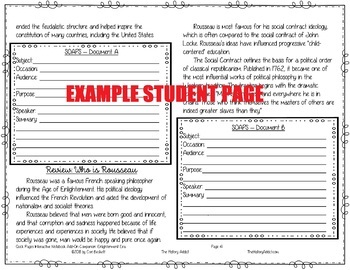 These templates are designed so that they can be used in conjunction with the Interactive Notebook for the Enlightenment Era lessons. The notes are the nearly identical and the graphics are similar. 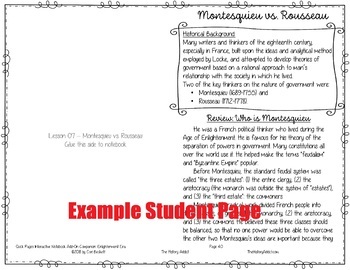 So, if most of your students have the real lessons in their notebooks, it’s perfectly fine if a few absent students have the Quick Pages templates. They will all have the same exact information. Hand those absent students a blank template that they can fill in or provide them with the pre-filled template to glue and go! We’ve all had students who are slow movers or students with dysgraphia or other fine motor skills who specifically struggle with interactive notebooks. Now, you’ve got two new options! While the rest of the class does the regular interactive notebook page, these students can use the 2D template where all they have to do is fill in the notes. This takes the pressure off of them to keep up with the entire cut, color, and glue procedures. Have a student with a more severe need? Simply give him the pre-filled template and allow him to color. He’ll still have the same information in his notebook and be able to participate in the lesson. Q: Do I have to use the Interactive Notebook for the Enlightenment Era to use this resource? A: No. These can stand alone, but know that this resource ONLY includes the templates and notes to fill in. Complete lesson plans including many student reading pages are only included in the interactive notebook. Q: Will these be available for your other notebooks? A: Yes! All my history notebooks will offer quick pages. I will be spending the early weeks of 2018 getting all the topics out to you. Q: Can I use these templates in Google Classroom or similar digital classroom?